Going out for ice cream is a vacation tradition! There is no better way to cool off on a hot summer’s day than enjoying a few scoops of everyone’s favorite treat. 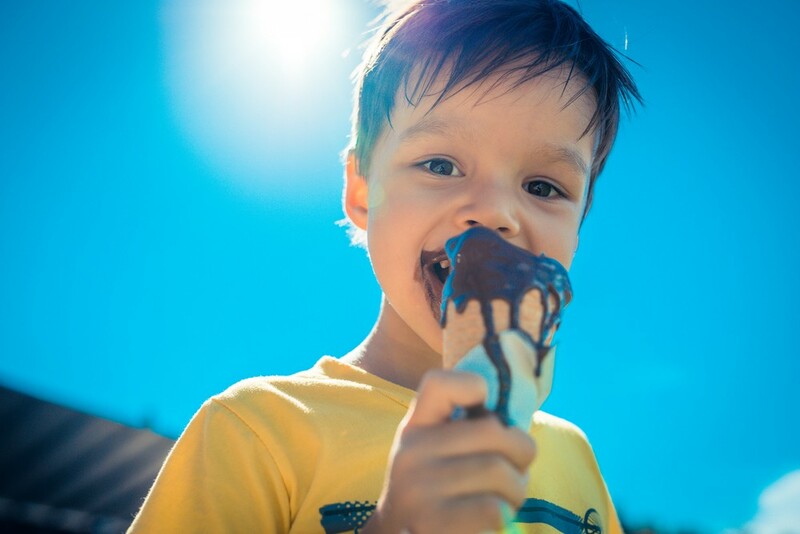 To help you make the most of your getaway, Aqua View Motel has put together a guide to five of the best places for ice cream in Panama City Beach. Hershey’s Beach Ice Cream Shop is just an 8-minute drive from Aqua View Motel, making it a very popular destination for our guests. This beloved shop serves 40 flavors of delicious Hershey’s ice cream that you can enjoy in a waffle cone or as a sundae. If you have a hearty appetite, we recommend trying their oversized banana split! The Pink Pelican Ice Cream Bar never disappoints! This superb creamery offers a variety of unique ice cream creations including Madison’s Chocolate Madness (an extra fudgy brownie sundae), Dylan’s Cookie Monster Delight (a special cookie sundae), and the Mindsweeper (a milkshake with a shot of espresso). With a seemingly endless variety of flavors and extremely generous scoops, it’s easy to see why the Pink Pelican has such a loyal following. The Ice Cream Bar is 15 minutes from our motel. 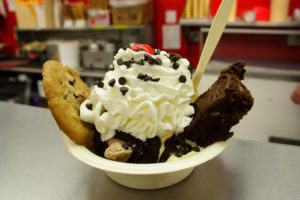 Homemade Ice Cream Shoppe is another one of the most popular places for ice cream in Panama City Beach. As you probably guessed by their name, all of the ice cream at this shop is made from scratch the old-fashioned way. During peak season there is often a line out the door, but trust us, it’s worth the wait! Some of the most talked about flavors at Homemade Ice Cream Shoppe include Butterfinger, Blueberry Cheesecake, and Coconut. This creamery is about 18 minutes from Aqua View Motel. David’s Sno-Balls specializes in New Orleans’ signature treat. A sno-ball is a refreshing dessert made from shaved ice and flavored with syrup. At David’s, you can order a “stuffed sno-ball” that is filled with soft serve ice cream. While the stuffed sno-ball is definitely the main attraction, David’s also offers great ice cream cones and milkshakes. David’s Sno-Balls is roughly 20 minutes from our motel. Located right across the street from a gorgeous beach, Thomas Donut & Snack Shop is the perfect place to savor an ice cream cone in the sunshine. This legendary shop is known for its wide variety of flavors, perfectly crisp waffle cones, and large portions. For a truly decadent dessert, try adding a scoop of ice cream to one of their homemade donuts! Thomas Donut & Snack Shop is around 25 minutes from our motel. 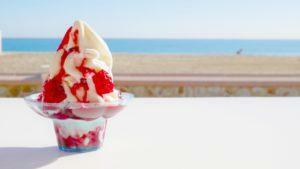 Guests at Aqua View Motel will love being near all of these excellent places for ice cream in Panama City Beach. Our motel offers an incredible location that is steps away from the world’s most beautiful beaches and close to all of the fun things to do in town. 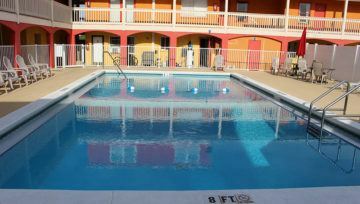 With an outdoor pool, rooms with flat-screen TVs and premium channels, and the best staff on the Emerald Coast, Aqua View Motel has everything you need for an unforgettable escape. To start planning your vacation, browse our selection of Panama City Beach motel rooms!